Fried rice has always been a go to meal at our house. It’s an easy meal that you can throw together, but when we added bacon to it life has never been the same. If you have a rice cooker follow cooking directions in user manual in not, follow the stovetop directions below. In a large sauce pan add cold water and rice and allow to sit for 10 minutes, this will allow the grains to begin to absorb the eater and they will cook more evenly. Cover pan and turn burner to high heat. Bring the covered pan to a boil, about 5 minutes. Do not lift the lid just listen for boiling sounds. Reduce the heat to low and let rice cook 5 minutes more or until water is absorbed. You’ll hear a hissing sound, or quickly lift the lid and check. Return heat to high for just 30 seconds and then remove pan from the burner, with the lid still on, and allow to steam for about 10 minutes. In a large frying pan over medium heat, melt the coconut oil. sauté another 2 minutes, add the frozen peas and sauté until thawed. Whisk the eggs and pepper together in a bowl. In the same frying pan over medium heat pour in the eggs and cook. 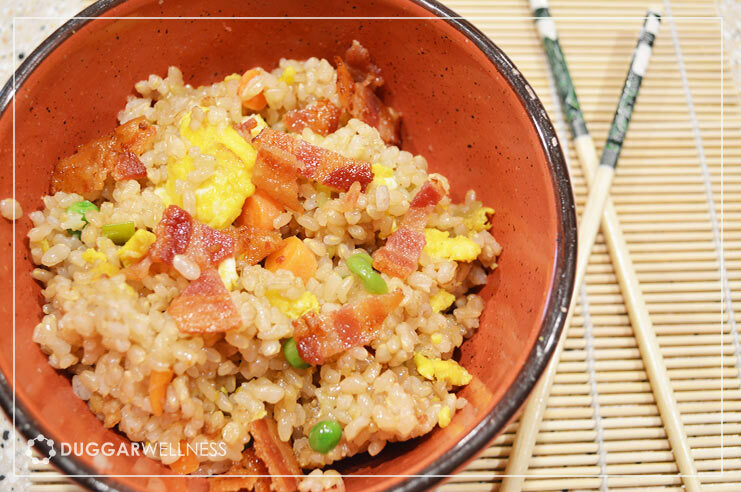 When the eggs are cooked stir them into bowl with veggies, add the cooked rice, Liquid Aminos, and sesame oil. Chop up cooled cooked bacon. Add bacon to the rice mixture and stir until well combined.